Feeding with a traditional livestock bale feeder doesn’t present much of a challenge out in the middle of your pasture. You’ll typically take the tractor, drop the hay inside and call it an afternoon, after all this is how it has been done for years. 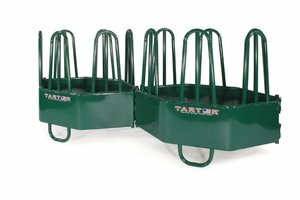 Like all livestock equipment suppliers, we carry a large inventory of the traditional hay feeders, but we came across this new design from Tarter and think it’s worth a look! The problem with a large fixed ring hay feeder is that once your livestock eat the outer layers of the bale, the bale shrinks in size to the point where they can’t reach it anymore. The hay is just out of reach and all it does is entice them to lean against the feeder. This of course leads to metal bending and even cattle climbing inside the feeder to finish off the bale in the center. This can lead to injury and the exciting struggle of trying to help them out! The ‘Flex Feeders’ are uniquely designed to shrink in size as the bale get smaller and allow your animals to eat the bale entirely. Each of the panels of these feeder are hinged like a door so that when leaned upon, instead of bending, they will actually slide inward around the remaining bale to provide consistent access until it is gone. The cattle feeder is made with a top bar all the way around the vertical bars while the horse design is open at the top. See the pictures and videos below for each style and consider this feeder the next time you’re looking for a new bale feeder. This unique design is worth exploring! As always, if we can help with anything at all, call us at (720) 238-2190, email Sales@BarnWorld.com or visit our website at BarnWorld.com today! 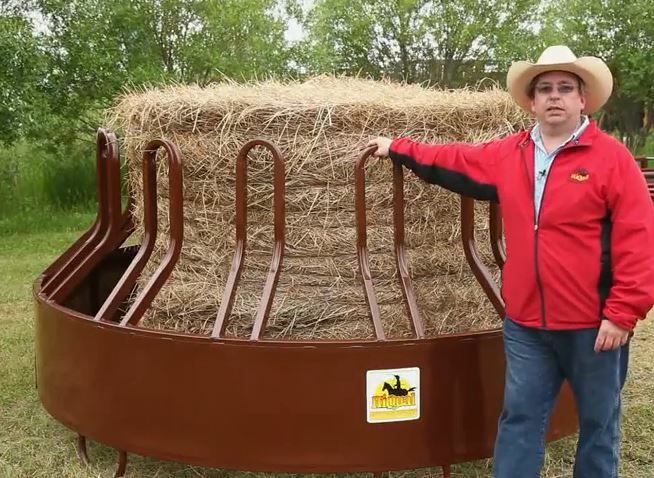 The HiQual Tombstone Hay Feeder design provides both protection for the feeder from abuse and hay savings for your farm and ranch operation. 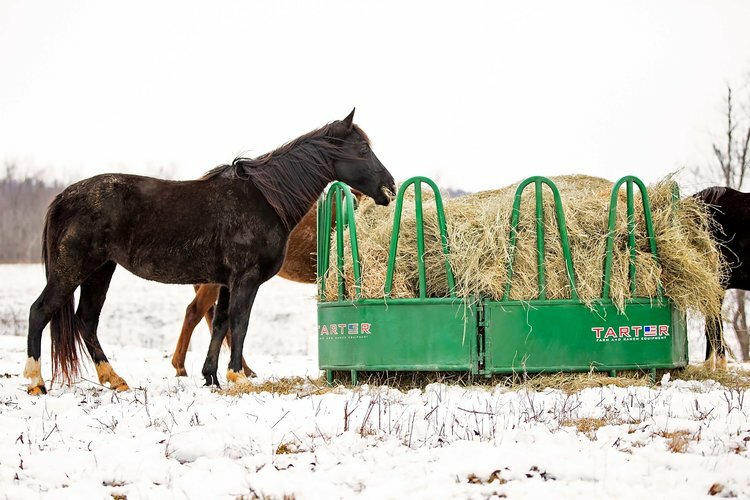 They are available for both horses and livestock and below is a quick rundown of how these feeders are designed for longevity and will provide reliable hay savings for years to come. Below are excerpts from their promotional video and key points that illustrate how valuable this can be for you and your animals. The Tombstone Saver is the feeder that really got HiQual the map back in 1980s and was their first patented item. Their research and development department looked at the problems that were currently associated with hay bale feeding and there were two key issues that they identified: One was that horse hay feeders wasted too much feed and secondly, they just weren’t durable enough. So they came up with this new patented design which we refer to as a Tombstone. The key feature of this product is the fact that not only is it a tombstone design, but that the tombstones slope inward toward the bale. This creates an inner ring and outer ring, so when a cow comes in to feed, as they’re picking at the bale, the loose feed drops inside the feeder instead of on the ground where gets trampled and wasted. Another nice feature about this design is the fact that is that it’s got an open top. Traditional bale feeders have a top ring, so what we found from our research is that when the cattle are feeding in this product, they tend to keep their head in the feeder rather lifting up and pulling feed out. So again, you get additional savings! How much you ask? Research at the University of Manitoba has shown that with the Tombstone Saver Horse Bale Feeder, you’ll save an average of about 60 pounds of hay for every thousand pounds fed as compared to a traditional slant bar style feeder. Another great design feature you’ll find with the off-set tombstone design is one that protects the feeder from damage. When the cattle are feeding, they typically want to lean in and on the feeder, which can cause stress on the metal and cause bending or even breakage. With the ‘off-set’ tombstone design, the animal’s legs are kept back away from the feeder before their shoulders can touch the tombstones. This takes away their leverage and they no longer have the ability to push against and move the feeder or cause damage to the uprights by leaning their shoulders or necks on them! Some other key things to look at with this design, because there’s other round bale feeders on the market, is the material used in construction. The upright hoops are welded directly to the top ring so it can take a lot of stress. It’s also made out of a lot heavier gauge steel than a standard 16 gauge feeder. So for extra strength and longevity, HiQual uses an 11 gauge top ring! 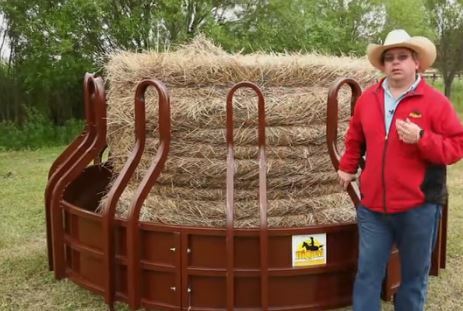 On the Hay Saver, the sheeting is mounted on the outside of the lower hay rings to provide a smooth and strong outer hay-saving skirt design. The sheeting not only helps save hay by containing it, but just as importantly, it stops the cattle from climbing up and getting inside the feeder. This particular feeder comes with 15 feeding stations which is a very high capacity and it’ll take a 6 foot round bale. You can also actually take the feeder apart and with the hinge kit, open it up to help loading a hay bale. At the joint, you just take the bolts out and install the hinge. You can then simply pull the pin and open the feeder up which then allows you to easily feed with a three point hitch. 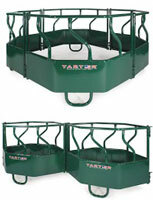 This feeder is more convenient and more versatile than your typical livestock bale feeder. It’s also important to look at the bottom of the feeder. There are three mud legs on each feeder panel and what the mud legs do, is keep it up out of the mud, that’s why they call them mud legs but it also prevents it from freezing down to the ground in the winter. Imagine if your feeder’s bottom ring was down in the ground and frozen. When you came to move it with your loader by putting a chain over the top to grab it, you’d put a tremendous amount of unnecessary stress on the product. Again, it’s very important to keep that up off the ground and out of the mud. One final thing to point out is that we are talking about quality and durability with HiQual products in general. 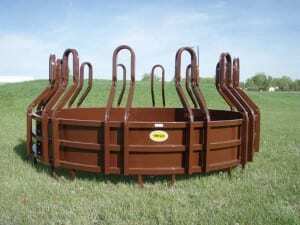 A simple design change makes a world of difference and you’ll find their Tombstone Hay Saver Feeder has a vertical support post which is welded between the top ring and the bottom ring underneath each tombstone. What that means is, when there’s pressure placed on the upright, you got the vertical posts, the horizontal ring and the sheet metal all working together in a coordinated fashion to prevent any bending. It all means that at the end of the day, this feeder will last you for 10, 15 or 20 years and won’t end up in the boneyard or out the back 40 being unused or discarded as a typical round hay bale feeder might. Take a look at the quality of material and design of this feeder and compare to others out there, then call Barn World at (720) 238-2190 to get yours shipped directly to you today! 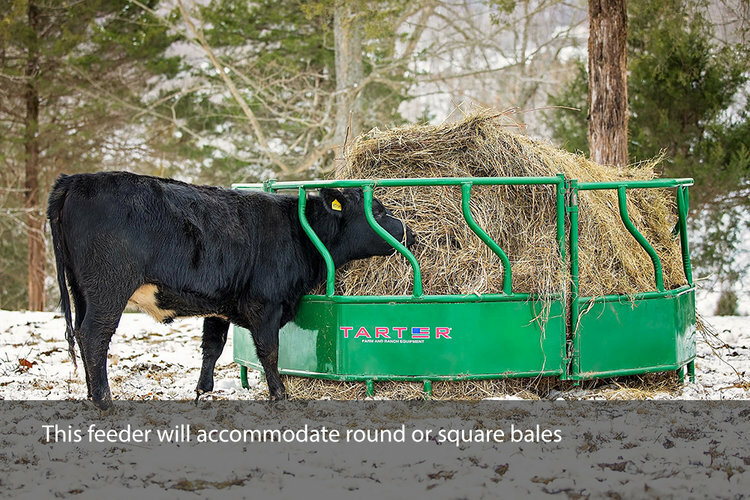 This feeder design is available as a traditional 15 station round bale feeder and also the larger, more heavy-duty 12 station bull hay feeder. Notice the Bull Tuff is slightly larger with more distance between the tombstones while the Hay Saver has the skirt welded to the outside for a smooth outer look to prevent climbing.